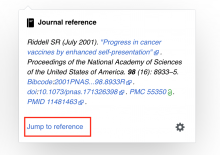 ⚓ T215063 Rename link in footer to "Jump to footnote"
Rename link in footer to "Jump to footnote"
The link in the footer of the reference currently says Jump to reference. It should say Jump to footnote because not all footnotes are references, they can also be comments etc. That's why the header of the reference preview says footnote as well, see T213907. Lea_WMDE moved this task from In preparation to Ready for pickup on the Reference Previews board. WMDE-Fisch set the point value for this task to 1. WMDE-Fisch moved this task from Ready for pickup to Doing on the Reference Previews board. [mediawiki/extensions/Popups@master] Rename link in footer to "Jump to footnote"
Pinging @Raymond because we are renaming one message key in https://gerrit.wikimedia.org/r/489743. Maybe he is able to help? Lea_WMDE moved this task from Demo to Done on the WMDE-QWERTY-Sprint-2019-02-06 board. I'm not sure it's worth introducing another term here. I understand the semantic concern, however I'm assuming that the majority of the footnotes are references/citations, and that comments are an edge case. We are already referring to it as a "reference" in the title of the preview (Book reference, Journal reference, etc.) 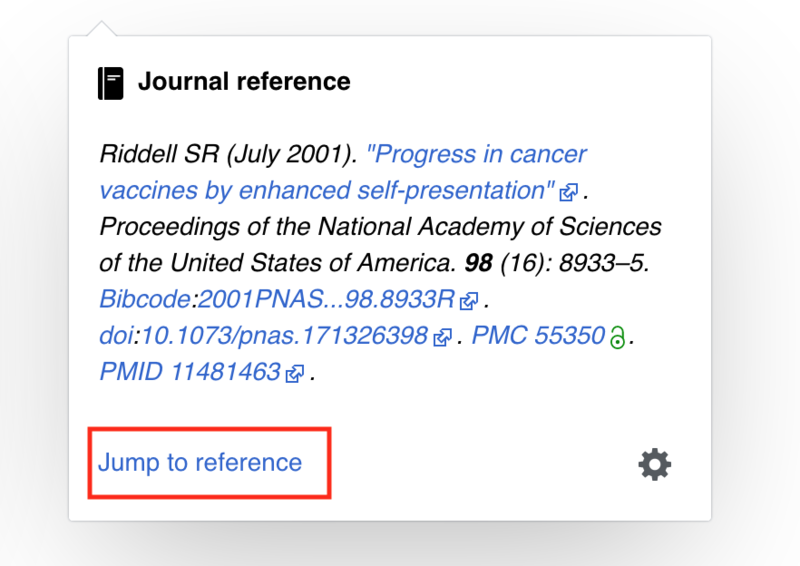 so I think it might be more confusing to then have a button that says "Jump to footnote"...it feels disconnected from the thing you're already looking at. Perhaps in the future we can introduce a "Comment" type/category in VE, and then use that here. Also, regarding T213907, it was unclear to me that we were agreeing to use the term "Footnote" in the title when there is no type specified, e.g. I think also in this case it makes sense to use the word "Reference". [mediawiki/extensions/Popups@master] Consistently talk about "Reference" instead of "Footnote"
thiemowmde removed jkroll as the assignee of this task. thiemowmde moved this task from Backlog to Demo on the WMDE-QWERTY-Season-Sprint-2019-03-20 board. thiemowmde added a subscriber: jkroll. thiemowmde added a subscriber: Lea_WMDE. @Lea_WMDE, with the two patches linked above all messages are now consistently talking about "references" again, not "footnotes".